With Texas-style fanfare, parishioners and their guests celebrate the dedication and opening of the new Church of Scientology Dallas, in Irving, Texas, on April 11, 2009. 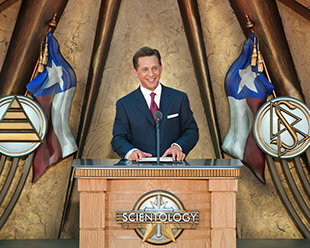 Mr. David Miscavige, ecclesiastical leader of the Scientology religion, presided at the grand opening event of the Church of Scientology Dallas, where he said Texas dreams of spiritual freedom would be realized. Mr. Miscavige is joined by Church executives and honored guests to pull the ribbon and officially open the doors the new Church of Scientology of Dallas. Anyone of any religion or belief is welcome at the Church of Scientology of Dallas, located in Irving, at the heart of the Dallas-Fort Worth Metroplex. The new Church is open seven days a week for tours, introductory films and seminars. All are welcome to visit the Public Information Center of the Church of Scientology of Dallas and tour its interactive multimedia displays presenting the principles of the Scientology religion, the life of Founder L. Ron Hubbard, and our international humanitarian programs. The chapel of the Church of Scientology of Dallas is the setting for ceremonies such as Weddings, Naming Ceremonies and Graduations, as well as being open to the community for meetings, events and special occasions. The expansive contemporary architecture of the Church of Scientology of Dallas allows for the continuing expansion of this Scientology congregation and activities with like-minded community groups. The Church of Scientology Dallas, located in Irving at the heart of the Dallas-Fort Worth Metroplex, opened its doors April 11, 2009. Mr. David Miscavige’s presence underscored the import of the day. The Church of Scientology Dallas was formally welcomed to the city of Irving by Mayor Herbert Gears. Next up to the podium was Ms. Teddie Story, Executive Director of a nonprofit social services agency, Irving Cares. She was followed by the Rev. James McLaughlin, Chairman of the National Congress of the Interfaith Alliance on Addiction. Finally, Ms. Shirley Dobson presented an official welcoming proclamation to the Church on behalf of the Texas State House of Representatives. “The fact is that all we have accomplished in our formative years was the dream that we could one day expand to such a degree that our organizations would rise to the level of the technology itself, that they would embody what appears in L. Ron Hubbard’s technology and policy. Well, that goal is now within our reach. The momentum is building for a future more glorious than ever imagined. And as the ribbon came down, Scientologists and friends, old and new, entered the new home of Scientology in Texas.